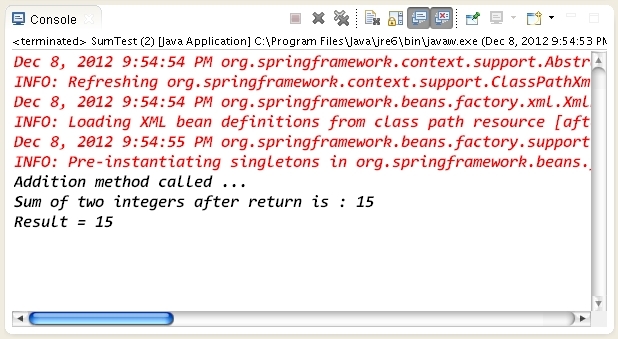 How to implement After Returning Advice using @AspectJ Annotation-Driven AOP in Java ?. A simple application to demonstrate how to implement After Returning Advice using @AspectJ Annotation-Driven AOP in Java. // Its a simple interface for the Sum service. // It contains one single method called as addition(). // sum of two numbers passed to it as arguments. //Aspect. Its not ordinary POJO class. // implemented by providing @AfterReturning annotation. // indicates when this advice executes. // to the afterReturning method.